African Mahogany Retail Wine Racks for commercial use. Free-Standing wine racks, presentation perches, island display and racking specifically designed for a retail sales environment. Island Display wine rack with single angle rack. Stand Alone. Also use this wine rack as 2 halves for different locations! Island Display retail wine rack with two angled rows & countertop holds up to 462 Bottles and measures 50 5/8" H x 47 7/16" W x 50 3/4" D. Also use this wine rack as 2 halves for different locations! 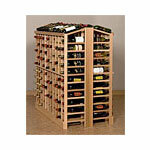 750 ml Round wood Wine Rack holds up to 192 Bottles. The Rounder measures 46 13/16" H x 48 13/16" in diameter. 750 ml bottle wood wine rack with 3 tiered display angle with display shelf that holds up to 319 bottles and measures 84" H x 47 7/16" W x 25 3/8" D.
750 ml bottle wood wine rack with 4 presentation rows. The rack holds up to 275 bottles and measures 84" H x 47 7/16" W x 14 3/8" D.
Wood wine rack holds up to 154 bottle of 750mL wine bottles with 4 rows of angle display. Wine rack measures 84" H x 47 7/16" W x 13 3/8" D.
This wooden Wine Rack holds Magnum wine bottles with 3 rows of display angles. Featuring space for up to 55 bottles and measurements of 84" H x 25 11/16" W x 15 3/8" D.
The bottle bin / wood case wine rack with 6 double perches holds up to 276 bottles. Measures 84" H x 47 3/4" W x 13 3/8" D.
African Mahogany Retail Wine Racks. 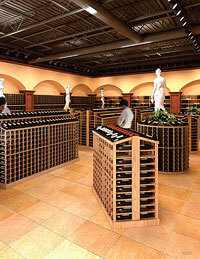 Free-Standing wine racks, presentation perches and racking specifically designed for a retail sales environment. Our commerical wine racks are designed to maximize display and showcse of your wine to maximize sales. Mahogany is a hardwood that is more durable for retail use than cedar or redwood. For our retail wine rack units we have chosen Sapele, a wood from the African Mahogany family. It’s durable, attractive and suitable for any retail environment. For orders of 6 or more units, please contact us for special product & delivery pricing.